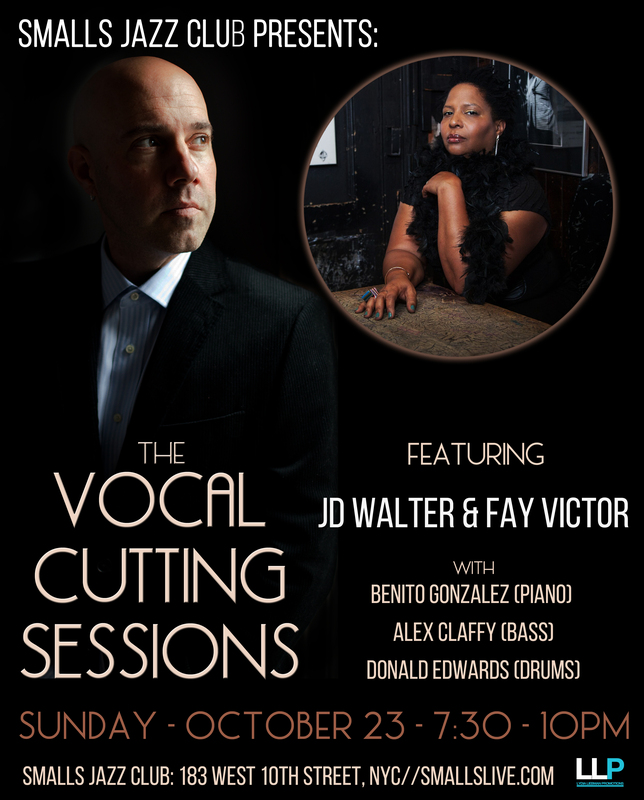 Smalls Jazz Club, located at 183 West 10th Street in New York, NY, is proud to present the inaugural Vocal Cutting Sessions featuring vocalists JD Walter and Fay Victor on Sunday, October 23rd at 7:30 PM. The cover is $20. More information can be found online at www.smallslive.com. The Vocal Cutting Sessions, presented by Smalls Jazz Club, is a new vocal series produced by esteemed vocalist JD Walter. The monthly series, which will continue at Mezzrow after the inaugural concert, aims to showcase the very best in cutting edge vocal Jazz. This will be presented in the tradition of the cutting contests that started with instrumental jazz in the 1920’s. JD will host a different guest each month. JD Walter is a jazz singers singer. A purist and an innovator, his style has been compared to many vocal titans, but it is uniquely his own and he has become a singular phenomenon on the music scene. He has released eight recordings, including the recently released “One Step Away”, which garnered great critical acclaim. Vocalist/composer Fay Victor, called “artistically complete” by the New York Times, consistently hones a unique vision of the vocalist’s role in jazz and improvised music. Victor’s snake-like ability to fuse her prodigious vocal talents in a myriad music arenas all the while maintaining her singular sound. Victor’s eight critically acclaimed recordings as a leader has seen praise in venerable media outlets worldwide. The next Vocal Cutting Session will take place at Mezzrow on November 20. More information can be found at www.smallslive.com and www.mezzrow.com.